Some of this post is just snippets of discussions that happen around the dinner table…or around the chicken evisceration table. Some of this post is stuff we have formally written out. Most of it hasn’t been spoken of outside of our immediate family. All of it has been prayed over…and hard. 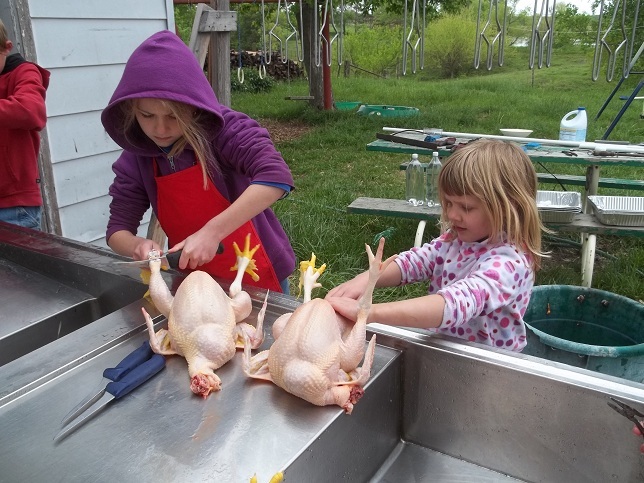 Just as I focused on budgeting a few months ago as we prepared to buy the rest of the farm, I am focusing on multi-generational farming now as I’m realizing how big my kids have gotten. If this isn’t your bag I hope you enjoy the pictures. You’ll probably get more posts like this now that Fields of Farmers has arrived in the mail. Well, I hope I will still be useful when I’m 87…and you are still helping with chickens when you are 61…but I suspect you will hand it to the next generation before then. But, yes, I would like to be out there with my great-grandchildren telling the same stupid jokes. That’s not what she meant to say. She meant to ask if I would still be out there when I was 50. Bear with her, she was cutting feet and oil glands off of chickens at a rapid pace. Oh. Well. 13 years from now is much more visible than 50 years from now. Still uncertain but much closer. Yeah. I expect I’ll still be butchering chickens when I’m 50. Will she still be here when she’s 24? What will she be doing? Will she be married? Kids? Will she choose to make her home here? Will she work here? How can I express my vision of a preferred future without imposing my will on her life? It’s tricky. If you’ll allow, I’ll tell you what we see through the fog and try to do so in a way that doesn’t enslave our children. I have no idea what is really ahead of us but I do have direction. Let’s look that direction together. I know, right? That number has been with me for a long time. I read Julius Ruechel’s book years ago and he suggested that cattle don’t really act like a “mob” until you have 500 head in one group. Then I read about Ian Mitchel-Innes having 6,000 cows in one group, introducing 400 bulls each summer! But that’s just the beginning. We’re taking the long-term view here. 5,000 cows requires 5,000 acres in Illinois…more elsewhere. That’s a big area on a map. Not as big as some of the ranches in Texas and Oklahoma but big in Illinois terms. I am necessarily counting on a fall in land prices and lease prices (brought on by an increase in interest rates, crushing and cleansing the economy) to make land available for low-cost producers (like me). Can you imagine converting corn ground that sits tilled, empty and idle for 7 months each year into a year-round carbon-sequestering, sunlight-catching, cow-fattening meadow filled with songbirds, bugs and spiders? Rather than produce a mere 200 bushels of corn we could produce 30 tons of hay…but we won’t cut hay. We’ll just let the cow do the work. Grass with roots 15′ deep. Rows of trees planted on contour. Ponds snuggled into every valley…every hollow hydrating the landscape, preventing flooding downstream, Trees, grass and swales working to prevent agricultural runoff…can you imagine enough farmers getting this idea for the the muddy Mississippi to run clear? I can. But we haven’t started yet! I mean, if we’re talking about 5,000 acres and if each of my 4 kids has 4 kids of their own…we’re going to need more than just beef cattle to keep us all busy and fed. What about dairy? A grass-based dairy herd has to have time to eat each day. You really can’t grow a dairy above 200 head because every step the cow takes to the milking parlor is time the cow is not grazing forage or laying on the hill chewing its cud. Could you grow bigger by building a milking parlor every 200-300 acres so we can milk larger numbers of animals at each milking…rotating through the larger farm over time? 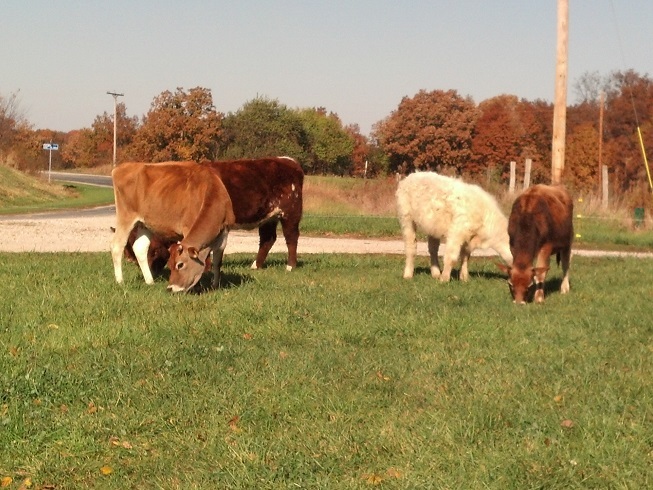 Could the farm’s beef cattle prepare better pastures over time for a dairy herd? Could the dairy herd lead the way through the pastures allowing the beef herd to follow and clean up what is left over? Or should I build a herd of thrifty dual-purpose cows? Maybe move South and buy a herd of criollo cows and select for milk production. But what about pigs? What about chickens? What about lumber? What about a machine shop? What about a hotel? What about an interstellar launch pad? What about ideas my children will generate that I can’t even imagine yet! I don’t know. Each of the things we currently do are small-scale. I can see that any of them will grow beyond what I can handle alone. As these things grow I’ll need my kids to step up and take on a larger portion of it…to continue to grow the operation. The 5,000 cow herd example above is a good illustration of that. Starting with 10 cows today I would be (according to my spreadsheet) 63 before we hit 5,000 cows (bringing in a gross income of something close to $1 million at today’s prices). Moving cows between pastures is not full time work, sorting and working 5,000 cows is more than one man can handle alone. Anyone involved in the farm is going to have to wear multiple hats to be busy full-time. There just have to be enough hats. But that’s all micro. Let’s go macro. Does Illinois even want me to be here? Is it in my best interest to ONLY have cattle in one place where one tornado can wipe it all out? …or one new state tax policy (in a state where the pension is only 49% funded (if you are really optimistic about future returns))! So what do we do? I work in Florida a lot. Can I lease ground in Florida? Yup. That plants our flag in another state. But should we diversify internationally? Wow. I could see a real argument for that. Can I still learn Spanish? Julie has a long, written story of waking up early one morning with her granddaughter patting her on the face. Three of our children and their families are at home in Chesterfield helping us to wrap up our seasonal work at this farm as we leave it in the farm manager’s hands and the rest of us join the fourth child at the ranch in Chile. Our parents, our kids, their kids all go with us. She wrote this as part of a business class the is taking through a coach. In short, the exercise was to imagine where you hope to be in the near future. Believe it or not, that 60 acre farm with 50 or so cows is attainable even if you are of modest means (as we are). The exercise forced her to imagine, not the trip from A to B, but the trip from A to C. If you’re going to C, you’ll pass B along the way…and keep going. Our immediate goal is to grow our farm to the point that it provides our family’s primary income with my parents in partnership. To stretch that, we hope our kids can earn their income here. To stretch that we may look for multiple locations. To stretch that, we may say goodbye to winters by living in the Southern Hemisphere half of the year. But it all starts here. Feet on the ground…covered in manure…building fence at night…wearing a head lamp in the cold rain. Tomorrow may be out of reach today…but I’m reaching for it anyway. What are you reaching for? If it helps, Julie and I sit down together at the first of each year and write down specific and measurable goals. We keep that list in front of us every day to help us stay focused. A new year starts in just under two months. You might start working on your list. Good luck with that one. Not with the die hard Keynsians at the wheel of the Fed and full blown QE to infinity and beyond. People think Bernake was bad? Just wait until Yellen steps in and watch QE increase to 100 billion a month to 1 trillion a month. And then throw in the fact the super rich always use land to hedge inflation. “Real Estate” in the form of McMansion and condo will be worthless (or close to it) but arable farmland is only going up for the foreseeable future. But I completely agree with you on everything else….lol. I love your posts and keep them up. It keeps me motivated. You and I are on the same page. Printing money only works until it doesn’t work. And it’s not working right now. What genius thought there was a correlation between interest rates and unemployment? But here we are. Yellen can only accelerate the crash. I’m not as certain about airable, productive farmland. I’ve heard that talk before. Interest rates, fuel prices and bumper crops abroad can really affect profit margins of my neighbors…none of whom appear to have any savings…just new green equipment. I would rather say “politically connected” than super rich. I am not concerned with how someone maintains the wealth they have earned. I am concerned with what politicians and their lackeys do with money they have taken from me…either directly or through inflation. Productive land is certainly one way to ride inflation but at some point the real wealth…the wealth earned slowly by making customers happy over a number of years…will go where it is more welcome. Maybe that is Chile. Maybe Galt’s Gulch…lol. Printing never works except to steal from the future at the expense of savers and the poor who pay the price. I’m all about a Gult’s Gulch. When we moving…..lol. Yup. But the consequences are not immediate nor are they immediately apparent. We have to be invited first. It’s hidden. Them there is big thoughts, brother. I’d not heard of Fields of Farmers thanks for mentioning it. “Waist deep in the big muddy?” Ever heard that… random. Anyway, I’m all for big thinking and I’m all for very small thinking too. If we want the mighty Mississip to run clear there’s a lot we need to do, starting in the uplands and along the ephemeral washes. seek ye first … and all these things shall be added into you. Oh, I’m down. Julie and I pray every day that we use the farm for God’s glory and not our own. That we are satisfying his designs and not our own ambitions. That we can be a blessing to our community, our ecology, our economy and our family. That’s first. The cows are just the tool. Thank you for a layout of your future. It could be used as a model for others as well. I like the idea your wife went through to imagine A, B, and C.
We’re planning to move in the next year. A big step for a mid 50’s couple to leave one profession (education) and move into another (farming) while moving 5 hours away from the only place we’ve lived in. But it is what we’ve thought and prayed about for years. It certainly isn’t for the weak of body and mind. You’re in for some …um…growing opportunities. You won’t feel like smiling when that first animal dies or a raccoon tears up your garden or gets into your feed sacks or when you are standing in the wind and rain wishing the cows were walking toward you instead of running away from you but …well…that’s just part of farming. And it’s probably why most long-term farmers are also long-term pray-ers. At least, around here. Feels great to bring an animal into the world but there is nothing you can do to keep it alive. That was the hardest lesson for us. We lost 2 goat kids during a rain storm. One was just dead. The other, Shivers, was still alive but wouldn’t nurse. We put a sweater on her, put her under a heat lamp and shoved a tube down her throat. She died two days later in Julie’s arms. Nothing I could do. Very humbling. Poor Shivers. I think Fields is his best work yet. Getting Field of Farmers for Christmas, even if I have to buy it myself. 5000 cows, huh? I thought you loved pigs…lol. I seriously think this plan is pretty cool. I think diversifying geographically and across political lines is very smart – Farm Bills and their equivalent in different countries can only affect one part of your total business, and a tornado in IL won’t affect the herd in FL. Waiting for the usable land to come available cheaply enough? I dunno about that part. How long can you wait? How many have the same bright idea? Yup. I’m not alone. Americans only live on 3% of the soil. Prices change. Write down lists of what we’re going to accomplish. Our nation’s agriculture is created one farm at a time. Really, this blog just exposes one facet of our lives. It’s just the farm. For example, I often list the farm books I read. But I also study SQL Server, SharePoint and PowerShell, read a dozen or so financial blogs and assorted books and, in my free time, enjoy playing board games with my family…most recently Ticket to Ride and (appropriately) Agricola. I didn’t mention Julie’s personal interests and goals or those of the kids…all of which we track over time. So our complete goal set covers more ground than I listed in this post. We work to leverage our individual differences to create a common family culture. And it’s just as easy as it sounds…lol. What a great post. Thank you for sharing your families vision for the future. How exciting to have a plan that incorporates your whole family. That’s the course we want to be on as well. My wife and I want our kids to grow up to be productive adults, working with us, with their families, side by side. I’m a few years older than you, so I may not see as much of our vision completed, but what a joy it will be, to see our kids take what we’ve started and run with it! Side note, I would be interested in knowing some of the financial blogs you read. You could email those if you don’t want to post them. Again, thanks for sharing your vision. Craig, I sent you an email with a list of links a few days ago. It is probably in your spam folder as the 2-bit email I am using gets routed there unless I am in your contacts list.